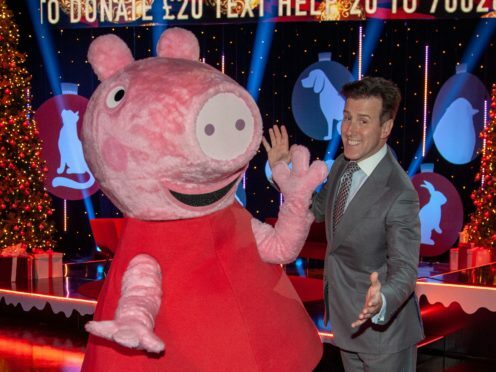 Strictly Come Dancing’s Anton Du Beke is pairing up with one of his most unusual dance partners – as he takes to the floor with Peppa Pig. The professional dancer spoke of his excitement at performing with the children’s television character as he rehearsed for charity telethon Help The Animals At Christmas, to be shown on Channel 5 on Friday. As well as performing on the dancefloor, he will present an hour of the show, which will raise money for five animal charities, with former Strictly contestant Gethin Jones. Du Beke said: “Dancing with Peppa is the most excited I have been since I did the samba roll with Gethin. “I think it’s going to be marvellous. He said the character was a firm favourite with his children George and Henrietta, aged 21 months. Co-host Jones, a contestant on Strictly in 2007, said he was pleased to work with Du Beke again, but they were “like an old married couple”. The show will include special episodes of Channel 5 favourites Ben Fogle’s New Lives In The Wild, The Yorkshire Vet, The Dog Rescuers, which will feature the cast of Neighbours, and Jo Brand’s Kitten Rescue. Among the stars who have shown their support for the telethon are Simon Cowell, who recorded a video message of thanks on behalf of himself, partner Lauren Silverman, son Eric and their dogs. The X Factor judge said: “So this is something which I think is really important particularly at this time of the year. You will all go to heaven for doing this. Cold Feet star John Thomson and presenter Gaby Roslin will host another hour segment of the show. The pair said the show would include some tear-jerking moments but lots of laughs as well. “We’re very naughty, the two of us, and we’ll be let loose on live television,” Roslin said. Help The Animals At Christmas will raise funds for the RSPCA, Scottish SPCA, Blue Cross, The Donkey Sanctuary and Wildlife Aid Foundation. The show will be on Channel 5 from 8pm on Friday.